The Future is Now. This was the phrase on a small sign my Dad made for me when I was in college. That simple phrase became one of my driving mantras in life, starting with college, but also in my marriage, my professional career and in my blogs. The phrase is a constant reminder to me that the choices I make right now determine my future. The phrase serves as a reminder to not put anything off, but instead do them right now. The future often seems so far off, when in reality the future is literally right around the corner. The future is only a few seconds away and the choices you make right now impact not just THE feature, but YOUR future. Soon? Why soon? Why not right now? I’m still trying to come up with the right topic to blog on. I just don’t have the time to blog. I have no idea how to get started blogging. I want to start a blog, but I can’t write. For some crazy reason, this is one of the biggest stumbling blocks for client’s I’ve consulted with on starting a new blog. People seem to want to spend months thinking of “just the right topic”. The sad part is that that they already know the answer. Big Super High Confidential Tip: The topic you should write your blog on is (drum roll please): A topic you are passionate about and that others are interested in. Criteria 2: A topic others are interested in. Both are critical in order for a blog to be successful. For example, I’m a Dad to six kids, and my wife and kids are my number one passion. Given this, I should start a blog about my wife and kids right? Well, some might be interested in hearing about the everyday things my kids do, but most wouldn’t. Blogging about my kids meets criteria 1 but not criteria 2. How about blogging on parenting with a big family? With that as a topic, I can share tips on how I parent my kids and include some often funny and crazy personal stories from my own kids. This meets both criteria – Something I’m passionate about AND something others, especially those with large families would be interested in. This is a blog I’ve seriously considered starting, but I think my kids and wife might disown me. So I haven’t. Most likely you’ll find ,that like me, you probably have a few topics you’re pretty passionate about, and writing on one of those seems more appealing for you. For me I am also very passionate about blogging and thus I love writing about blogging, building websites and earning income online. What topics are you most passionate about? Would others be interested in them? If so, you just found a few candidates for your blog topic. That took what? Five minutes maybe? Actually you do. You just need to make your blog a priority over some of those other things you spend time on. I’ve already written a pretty exhaustive article on the topic of finding time to blog, so I won’t repeat it here. But you really do have time to blog. Don’t get caught up in thinking that you need 8 hours a day 5 days a week to run a blog. Sure, we would all love that, but most of us just can’t dedicate that amount of time. Determine how much time you can dedicate, and use that time to it’s fullest. Some blogging is better than no blogging and you literally can run a blog on just a few hours a week. To give you some perspective, I hold down a full time job that often requires me to work 50-60 hours a week. I’m also a husband and parent to six kids. Those two things alone require a very large chunk of my time. Yet, I still have time to sleep, blog, do design/development work for clients, and play a few video games I enjoy. Valid concern, but not a invalid excuse. The web is full of tutorials on how to get started blogging. Call me partial, and excuse the shameless self promotion, but I’d recommend you check out my series: Start a Money Making Blog. But, there are many other sites and blogs on the internet that have great tutorials as well. Starting a blog does require a bit of technical knowledge, but honestly it’s not really that hard and certainly not something you can’t learn. Don’t be intimidated, just jump in and start learning. You are not alone, most, if not all of us have this fear. But honestly, if you don’t try how will you ever succeed? If Thomas Edison is ok with failure, why can’t you be? Oh, and by the way, if the topic you choose to blog on is one you’re passionate about and it’s one that others are interested in, how could you fail? One other question for you to dwell on: What’s the worst possible thing that could happen if you start a blog and it doesn’t do well? Don’t let fear control your decisions. Tim Ferris tells us in the 4-hour work week to “Do one thing everyday that scares you”. Maybe starting a blog should be your one thing for today. First off, you can write. Most, if not all of us have graduated high school. For those that haven’t, you still went to school for at least 10-11 years. As a result, you’ve learned the basics of writing, spelling and grammar. While you may not be able to write to the level of Mark Twain, William Shakespeare or Charles Dickens, you can write. Frankly, your writing target audience should be high school level anyway, as this level is easier to read, understand and makes for more popular articles. How do you get better at writing? By writing. The more you write, the better you’ll get a writing. I’m a perfect example of that. I am not a writer. Some of my first articles were horrible and required a significant amount of revision and correction, even months after I published them. But, the more I wrote, the better at writing I became. Writing is an area of constant improvement for me and each time I write an article, I get a little better at it. This is another concern that often comes up when I’m working with my clients. What is an expert anyway? Given you’ll be blogging on a topic you’re passonate about, you have knowledge derived from experience. Thus, by definition, you are an expert. A common mistake people make is thinking they must know more than everybody else in order to blog on a topic. Not true. If people are searching the web for an answer, and you have the answer, than in their minds you are the expert. Being an expert is all about your mindset. You’ll know more than some and less than some. The more you blog, the more you’ll research and learn and the more of an expert you’ll become. You are an expert on something right now, and chances are it’s the thing you are passionate about, because that is probably where you spend your time. Stop thinking like a non-expert and start acting like an expert. The single biggest mistake people make is that they think too much. They feel like they have to have this big complex plan in place for their blog. They think they have to know everything there is about blogging before they can start a blog. The reality is: if you really do have to put all of this in place before you start a blog, you’ll never actually start one. The single best way to learn is to just start blogging. Sure, you’ll make some mistakes. Some things you try won’t work, but others will. I’ve been blogging successfully now for more than 5 years, and I still learn something new everyday. I also make mistakes and have failures very often. Some failure is the nature of the beast and I would even venture to say that if you aren’t failing, you aren’t trying new things enough. 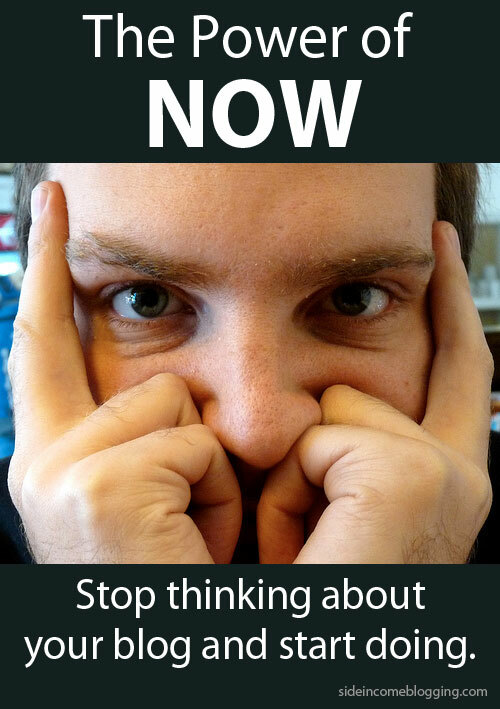 Regardless of where you are in your blogging journey, use the power of now. Don’t hesitate, don’t procrastinate, don’t over think, do whatever it is you want to do right now. If you’ve been wanting to start a blog, head over to my Start a Money Making Blog series and follow the steps. I’ve followed these same steps for myself and my clients, and they work. If you get stuck or have a question, just drop me a line. Thank you for writing such a clear, concise and well thought out blog. Love it. I am a blogger myself and started one year ago. Everything you say here is true, you have to go for it, if you want to write a blog. Just start it, and then the journey begins. I am still struggling with the ‘being an expert’ bit as sometimes I don’t feel qualified to advise people. However, it is my opinion and my experience, so I can give that, and if it helps people then, that’s awesome. As always any blogging advice is always welcome to us newbie bloggers. Hi Kim and thanks for taking the time to leave a comment and for you kind words. I think your perspective on being an expert is good, and frankly that’s all experts really share is their opinion and experience. Even the “elite” experts get challenged and proved wrong. I think as you continue to blog and continue to gain reputation and experience in your niche, you’ll get more comfortable with being an expert.